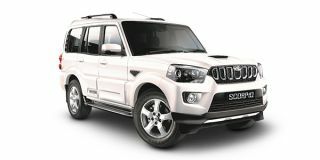 Mahindra Scorpio price in Mumbai starts from Rs. 9.96 lakh (Ex-showroom). Scorpio is available in only 9 variant. Mahindra Scorpio's top competitors are Mahindra Marazzo (price starting at Rs. 10.18 lakh in Mumbai) and Mahindra Bolero (price starting at Rs. 7.53 lakh in Mumbai). Q. Want to know how much price will increases if Airbags and Power Windows are added in Scorpio? Q. Which is better Marazzo or Scorpio in terms of maintenance? Q. Which variant has low maintenance S3 or S5? Q. Is there any offers in December month? Q. How is the maintenance of Scorpio? Q. New Scorpio petrol model available in kerala ?